Step 1: Preheat the oven to 400 degrees F. Poke the sweet potatoes several times with a fork and bake for about 35 minutes, or until tender. Let cool slightly, then peel and transfer them to a food processor. Puree until fairly smooth. Step 2: In a small saucepan, combine the cream with the butter and the vanilla bean and seeds. Bring to a simmer. Remove the vanilla bean. With the processor on, carefully pour the vanilla cream into the sweet potatoes and process until smooth. 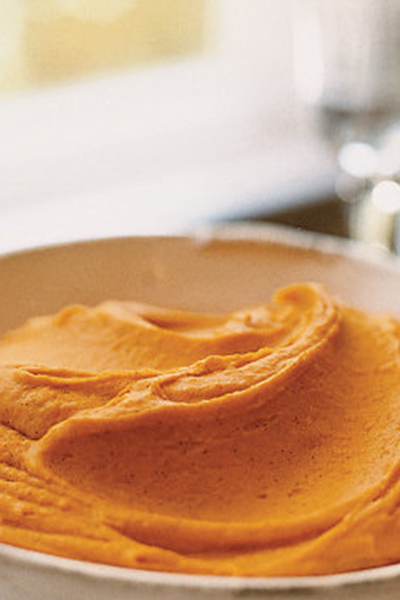 Season the sweet potato puree with salt and pepper, transfer to a bowl and serve. Enjoy this delicious, simple recipe from Food & Wine!